President Donald Trump speaks during a joint press conference with French President Emmanuel Macron on April 24, 2018. | FBI Director Robert Mueller speaks during a news conference at the FBI headquarters June 25, 2008 in Washington, DC. 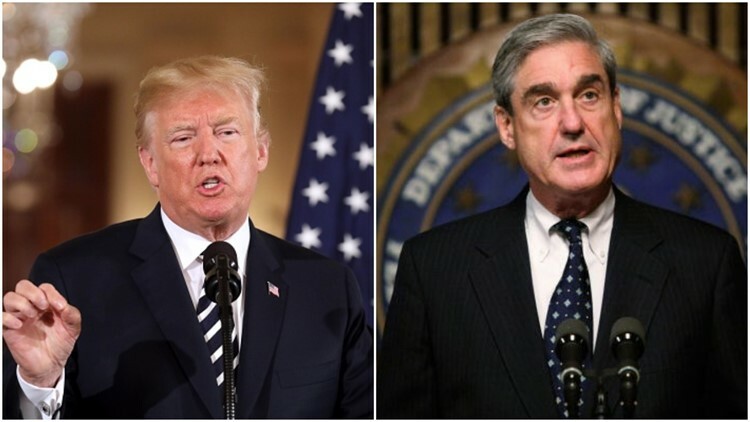 WASHINGTON — CBS News will air “The Mueller Report: A Turning Point,” a one-hour primetime special on the Special Counsel’s two-year investigation into the allegations that President Trump coordinated with Russia to win the White House. The special, anchored by Jeff Glor, will air on Monday at 10 p.m. on the CBS Television Network. It will also be on CBS News Radio and available to all CBS Stations via CBS All Access, and available on CBSN and CBSNews.com at 1:00 a.m. The special will “unpack the findings of a two-year investigation into President Donald Trump, his aides, allies and associates answering the question of whether the then candidate and his campaign coordinated with the Kremlin to win the White House and if the president obstructed justice,” according to CBS. Attorney General William Barr reported to Congress on Sunday that the Special Counsel did not find that Trump’s campaign coordinated with Russia to influence the 2016 U.S. Presidential election. The report was inconclusive about whether or not the President committed obstruction of justice. CBS says the report will explain why the Special Counsel was not able to exonerate him on obstruction of justice and what’s ahead for the President, Capitol Hill and the investigation in New York. Special Counsel Robert Mueller has brought forth charges against three companies and at least 34 people so far. So far Trump’s former national security adviser, his former personal lawyer and one-time campaign chairman and deputy chairman have plead guilty. RELATED: What happens next now that Robert Mueller finished the Russia investigation? The special will also dive into the hacking of DNC computers and the “cyber-espionage” campaign to influence the U.S. President election. By the end of the special, CBS says viewers will understand which of Trump’s men were involved in the investigation and how their lives have been impacted since it began.